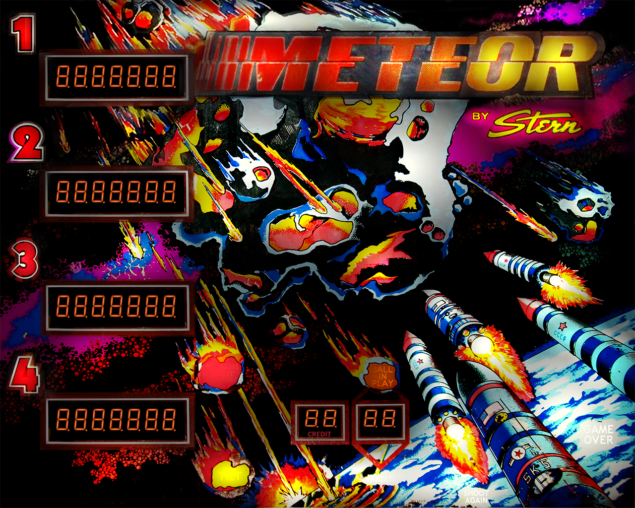 Stern’s 1979 Meteor pinball game was produced in conjunction with the movie Meteor by American International Pictures. The game came out as a promo for the movie which starred Sean Connery and Natalie Wood. This game features three flippers, one pop bumper, two passive bumpers, two slingshots, three star rollovers, three 3-banks of drop targets, one spinning target and one standup target. Meteor also features one 6-bank of memory drop targets. These special drop targets are held in memory and restored prior to each player’s next ball. The bank then increases the bonus multiplier and activates other features. The spinner is a variable value spinner: scoring increments increase and decline with Meteor target bank positions. Rocket bonus alignment is the key to wows and specials. The outhole scores rockets times the bonus multiple and the maximum bonus rewards player with total board visual display. Like the movie which was Oscar-nominated in 1980 for best sound, Stern’s Meteor features a new-for-the-time audio system: the SB-300 sound board. Matching the growing tension of a gigantic meteor approaching Earth, the game’s background buildup sound leads players into the excitement. This game was designed by Steve Kirk. Artists Leslie Kaip and Jorge Obregon drew their inspiration for the backglass and flyer from one of the movie’s advertising posters. This 4-player game has been configured for free play. Please call or email for more details.